Santa Fe Bandstand is a free summer music festival on the Historic Downtown Santa Fe Plaza that runs weekly throughout the summer. Most performers are from Santa Fe but the venue has grown since its 1995 inception to now include upcoming national acts. To check out this summer’s performers, click on this to go to the Bandstand’s schedule and website. This free, outdoor community-building event is organized by Outside In Productions, which began to provide free live performances and workshops to people confined to shelters, nursing homes, treatment facilities and other institutions. Places where people would not otherwise have access to the live arts. The Santa Fe Plaza is surrounded by numerous historic museums, shops, restaurants, and hotels. 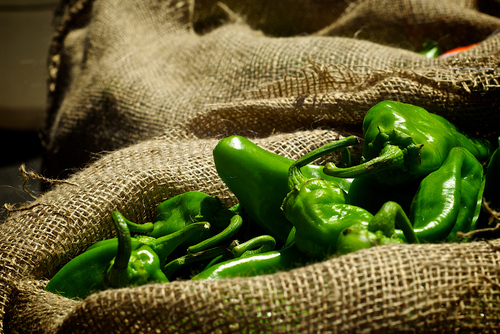 Santa Fe also hosts one the top national Farmer’s Market and Artisan Markets. Just additional wonderful outdoor activities in the Land of Enchantment! 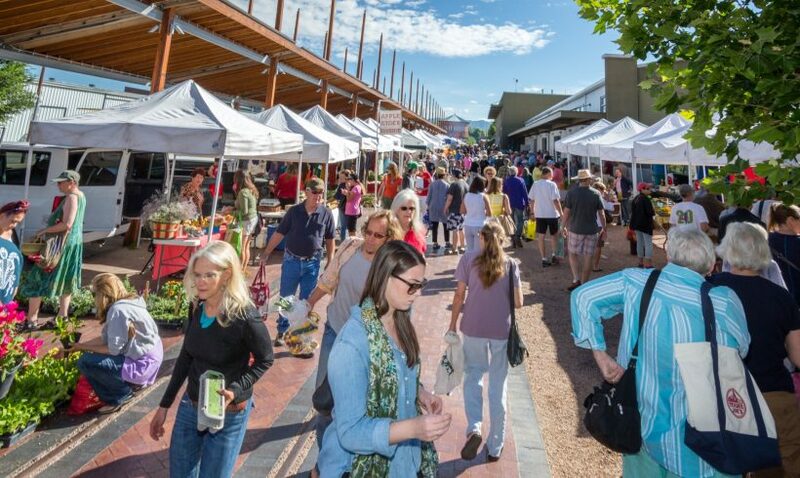 Voted one of the “Top Ten Farmers’ Markets” by Sunset Magazine, the Santa Fe Farmers’ Market is one of the oldest, largest, and most successful growers’ markets in the country. Serving more than 150 farmers and producers in 15 Northern New Mexico counties, the Market brings fresh food, education, and fun to our community and promotes small farms and sustainable agriculture. Unlike most farmers’ markets in the U.S., the Santa Fe Market assures that all products sold by its vendors are always locally grown by the people selling them. One hundred percent of the vegetables, fruits, and nursery plants available at the Markets are grown in northern New Mexico. The same goes for at least 70% of the ingredients and materials used to make all processed and craft items. At the same location, on Sundays, is the Artisan Market. It began in 2009 and it represents a wide variety of New Mexico’s artists and craftspeople. The Sunday market offers a unique opportunity to enjoy local art and music inside the Farmer's’ Market Pavilion. You will find pottery, painting, jewelry, sculpture, fiber arts, photography, hand-blown glass, artisanal teas and handmade herbal body products. It's the perfect place to buy a gift for yourself or a loved one, or to find one-of-a-kind souvenirs and mementos. Click here to go to the Farmer's Market website. And, as usual, if you are in Santa Fe, please don’t hesitate to come by our centrally-located office, or give us a call or email. We would love to go to work for you! Santa Fe certainly lives up to its motto as “the city different”, especially in it’s events. If you’re in the mood to do something different this month, then check out these upcoming events in Santa Fe! If cigar box art is your thing, then visit the New Mexico History Museum for this unique art exhibit that showcases artwork created during the golden age of cigar art labels from the 1880s to the early 20th century. This one man show features jewelry designer and silversmith Lawrence Baca. It runs through Valentine’s season to Feb 28. There’s also an artist’s reception from 5-7pm. 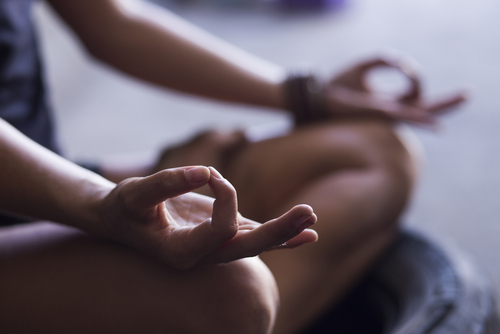 This celebration combines the 3 elements of healthy living: hiking, meditation, and Yoga. You’ll be hiking through sacred lands and practice yoga, followed by lunch and meditation in a limestone art cave. There’s always something different to do in Santa Fe. Join us every week on our blog for more great ideas and reasons to buy a home in Santa Fe. What makes Santa Fe different? Many things do for sure. But the extraordinary food is certainly one the main reasons Santa Fe stands out as one of the best places to buy a home. Here's a few choice selections you might want to try. 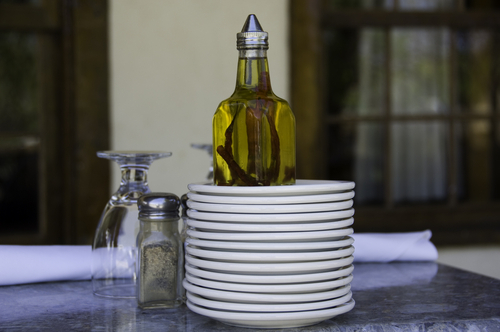 Rated the best restaurant in Santa Fe by Trip Advisor, Sazon stands out as a fine dining experience. Since 1991, Chef Fernando Olea has been offering Santa Fe diners his unique blend of traditional and contemporary Mexican cuisine. The menu is kept small so that he can focus on the quality of the dishes, which feature fresh produce and meat. The food is only matched by their outstanding service! Chef Martin Rios, a native of Guadalajara, created this restaurant with his wife, Jennifer, as a place where people could enjoy award-winning American cuisine in an environment that was both refined and comfortable. They feature dinner items such as Pan Seared Atlantic Salmon, Maple Leaf Farm Duck Breast, and Pan Seared Colorado Lamb Loin. And they also have space to book your next event. If you're in the mood for farm fresh American cuisine, the the Radish & Rye won't disappoint. You can dine in their intimate dining room, or in the lively bar. This establishment is certainly a great experience that delights many reviewers who comment on the outstanding quality of both the food and service. There’s more to Santa Fe than just great skiing. Did you know that Santa Fe has one of the largest art scenes in the US? Artists are irresistibly drawn to Santa Fe because of its natural beauty. And who can blame them? Generations of artists have come here from all around to form this artistic community. They sell their works at over 250 local galleries, which certainly is telling of the strong artistic vibe here. For four centuries, Santa Fe has been a melting pot of cultures. You can see it in the food, architecture, and the diversity of its people. One great example of Santa Fe’s food is the local favorite, Tomasita’s restaurant, which serves up authentic New Mexican fare, along with their famous chili. The owner of Tomasita’s does his best to stay with traditions, while innovating to stay with the times. Margaritas are serious business here. They even have a backup machine. As far as the art scene goes, Meow Wolf is certainly one of the most unique art attractions in Santa Fe. They turned a bowling alley into a hub of innovation and immersive art. It acts like a science fiction, with alternate realities and secret passageways, all meant for you to explore and experience, like a 3D book. If the art and food scene of Santa Fe speaks to you, then why not buy a home here? Start your search for a home in Santa Fe today with our powerful home search tool. People usually think of Santa Fe as a mecca of Southwestern art, jewelry, and spiritualism. But that image is beginning to evolve, thanks to a group of oddball artists and entrepreneurs. One of these entrepreneurs has introduced a new cultural destination, called The House of Eternal Return. It’s a 2-story Victorian built inside a converted old bowling alley owned by Game of thrones author George R.R. Martin. It was built by art collective Meow Wolf and looks like something out of the 1970’s with its faux wood paneling and afghan covered beds. What do you do in this house? You go through the various passageways and enter into different worlds, like a forest of neon trees or a spaceship that looks like something out of Star Trek, or a mobile home stuck out in the dessert. You follow clues in the house to find out the mysterious fate of the family that lived there. You can simply enjoy the visual elements, or unravel the mystery. It’s become quite the attraction and has brought in 350,000 visitors and $4 million since it opened in March! No doubt when you considered buying a home in Santa Fe, no doubt you envisioned all of the great things there are to do here. Santa Fe is a unique and culturally rich city, and so are its attractions. Take a look a just a very small sampling of all that awaits you here in Santa Fe! Meow Wolf: This is a newly opened venue for the Santa Fe art collective Meow Wolf. Meow Wolf’s immersive experiences will transport you to fantastic realms. The Santa Fe Opera: Come here for the music experience of a lifetime. This open air theater is a magnificent piece of modern architecture. Santa Fe Indian Market: This market has brought together the most gifted Native American artists from around the US for over 90 years. 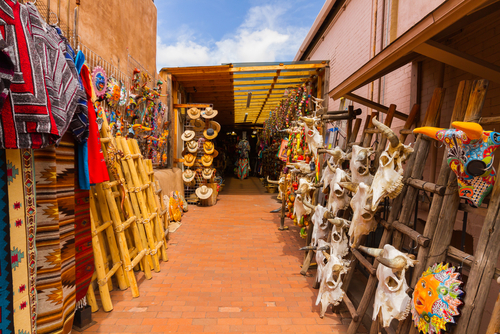 Spanish Market: The Santa Fe Spanish Market combines traditional and contemporary Spanish Colonial arts and culture with several hundred artists selling a wide variety of items. New Mexico Museum of Art: Both the art and the building are works to behold. Detailed murals inside and out capture New Mexico history and culture. Of course this is only the beginning. Santa Fe’s rich culture and heritage is showcased in its many attractions. Check back on our blog each week for more fun ideas and real estate information. What's happening in Santa Fe. This exhibition showcases one of the largest and most significant collections of 17th to 19th century devotional artwork in the country, featuring Spanish Colonial Viceregal paintings, sculpture, furniture, silverwork, and objects from the former Spanish Portuguese colonies – present-day Bolivia, Peru, Argentina, Mexico,Ecuador, Chile, Venezuela, Guatemala and the Philippines. The exhibition also includes paintings by noted European Old Masters, Russian icons, and a very rare collection of bultos, cristos, and retablos by significant New Mexican santeros. Art of Devotion exhibits not only a significant ecclesiastical tradition and its manifestations across Europe and the Americas; it represents devotion as a seamless element of daily life. The majority of these works and objects were not cloistered in churches, but were kept in private homes and chapels where they were used, looked at, and lived with as part of the rhythm of daily life. The eleven paintings by Oli Sihvonen in this exhibition are probably the least known by the artist, but quite possibly his most important series of paintings as they are a culmination of decades of his thinking about and examining visual perception through the use of reductive forms and color. This is the first time that most have ever beenexhibited and the first time all have been presented as an exploration of the subject of the artist's two grants in the 1980s from the Pollock-Krasner Foundation and Gottlieb Foundation to create movement in paintings. They conflate the elements he developed in his better-known and earlier series, including “ellipses”, “grids” and “ladders”. However, throughout much of his career, Sihvonen wanted to capture time in paintings and he did so by focusing on the temporality of such things as movement, beat and rhythm. Interested in the mathematical principle of Set Theory, he applied that to painting, with his reductive elements each comprising a set. By repeating each element within a set, Sihvonen developed a beat and pattern that amplified the set. By combining different sets, he generated a sense of randomness that conveyed both the concepts of chance and time. Not only does one see in these paintings blocks of vibrant and angled color bracketing and defining thin black and white stripes and pinstripes, but the overall feeling is they are vibrational and full of energy. Compositions are activated by the lines with their alternating pattern and variations in width, creating both depth and movement from the layering of pattern on pattern and challenging visual perception. One person exhibition of paintings, prints, and drawings by George Toya (Jemez). Opening reception, January 31, 2014 4 - 6 PM Exhibition through March 21. This exhibition features figurative works in the realm of Magical Realism. Brown bases her current body of work on analysis of her own dreams. WHEN: March 1 - 31, 2014 DIY Santa Fe, a month-long celebration of do-it-yourself artistic expression, featuring 30 + local artists teaching a variety of art forms throughout the city of Santa Fe. Class prices vary. All class reservations must be booked directly with the artist. Open: Thursday - Sunday, 12-5pm suggested $5 donation Santa Fe-based emerging artists Sandra Wang and Crockett Bodelson make up the collective SCUBA. In honor of winter and of the fleeting arctic, but also as an opportunity to create a series of fun adventures and cool spaces, SCUBA presents ICEPOP, a newly commissioned, multi-pronged project that examines ice, exploration, and mobility. Working with ice as both material and muse, in both its natural and man-made forms, ICEPOP is a celebration of arctic exploration, crystalline forms, white, melting, translucence. The centerpiece of the exhibition is a modified, solar-powered box truck called Ice Shelf that is equipped with retail, research and living space and inspired by notions of mobility, simplicity, and access. ICEPOP is augmented by a retail store featuring multiples made by emerging artists as well as field trips to cold places, a film series, an outdoor project, and a panel discussion about the trends of arctic exploration in recent art. Lost your passion? Have too many? Need new inspiration and direction? Come join us for an amazing and fun five hours where you'll get clear about your top five passion and begin living them more fully. AnnaMaria Cardinalli performs at Museum of Fine Art's Goya Exhibit - Final Month! The New Mexico Museum of Art is presenting a rare Goya exhibition that is not to be missed. AnnaMaria Cardinalli will be performing a program of Spanish Composers to accompany the viewing from 1 - 3 pm on Saturdays and Sundays while the exhibit lasts, and on Sundays, admission is free to New Mexico residents. The Santa Fe Pro Musica Orchestra performs works of Debussy, Mahler, and Shostakovich, featuring Deborah Domanski, mezzo-soprano. Thomas O'Connor, conductor. Doing Good, Deliciously! The first annual Divine Decadence Chocolate Challenge features ten chefs who will be competing for the best chocolate creation. Celebrity chefs and VIP ticket holders will do the voting. Hors d'oeuvres, complimentary champagne, cocktails, music and more are to be savored by all during this chocolate extravaganza that supports the work of La Familia Medical Center – the ONLY resource where members of our community can receive high quality medical, dental and preventative care for free or at a price they can afford. Join us in Doing Good, Deliciously by purchasing VIP or regular admission tickets at 982-4599 or online at www.lafamiliasf.org. Legends of the Celtic Harp. Arthur Bell Auditorium. Music and spoken-word performance by three of the most celebrated Celtic harp players in the world: Patrick Ball, Lisa Lynne, and Aryeh Frankfurter. $15, 7 pm, Harwood Museum of Art, 328 Ledoux, 575-758-9826, harwoodmuseum.org. Native American Flute and Spanish Classical Guitar Music by six-time Native American Music Award Nominee and two-time New Mexico Music Industry Award winner Ronald Roybal. Ronald is a Santa Fe mainstay! Join him in the intimate lounge and Amaya Restaurant at the Hotel Santa Fe, the only Native American owned full service hotel in Santa Fe, every Friday and Saturday from 7-9pm. Call 505.955.7805 for Amaya Restaurant reservations. Now in its fifth year, NM Restaurant Week is an 8-day culinary celebration featuring value-priced dinners and lunches. Multiple-course, prix-fixe dinners will be offered in four categories: $25 for two for casual-dining restaurants, and $20, $30 or $40 per person, depending on the restaurant. Some restaurants also will offer prix-fixe Restaurant Week lunches. Restaurant Week diners can also expand their epicurean horizons by taking one of the many cooking demonstrations, classes, and other daytime events offered during Restaurant Week. For information on events and tickets, visit either of the NM Restaurant Week websites, www.nmrestaurantweek.com or www.dinenewmexico.com. Since the 1930s, numerous artists have used the simple act of sharing food and drink to advance aesthetic goals and to foster critical engagement with the culture of their moment. These artist-orchestrated meals can offer a radical form of hospitality that punctures everyday experience, using the meal as a means to shift perceptions and spark encounters that aren't always possible in a fast-moving and segmented society. Feast surveys this practice for the first time, presenting the work of more than thirty artists and artist groups who have transformed the shared meal into a compelling artistic medium. The exhibition examines the history of the artist-orchestrated meal, assessing its roots in early-twentieth century European avant-garde art, its development over the past decades within Western art, and its current global ubiquity. The exhibition will introduce new artists and contextualize their work in relation to other influential artists, from the Italian Futurists and Gordon Matta-Clark to Marina Abramović and Rirkrit Tiravanija. Feast addresses the radical hospitality embodied by these artists and the social, commercial, and political structures that surround the experience of eating together. Join the feast and discover first hand the ways in which artists are using shared experiences with food and drink to spark new encounters with the world around us. As part of the exhibition, SITE presents an array of participatory projects, meals, and salons. Highlights include The Act of Drinking Beer with Friends is the Highest Form of Art, by Tom Marioni, and a series of one-on-one meals with artist Lee Mingwei, held after hours within a sculptural installation at SITE Santa Fe. Also, the winner of SITE's community fundraising dinner, SPREAD 4.0, held on October 11, 2013—Axle Contemporary's The Royal Bread Show—will be included in the exhibition. Feast includes art, documentary materials, and new public projects by Marina Abramović and Ulay, Sonja Alhäuser, Mary Ellen Carroll, Fallen Fruit, Theaster Gates, Felix Gonzalez-Torres, InCUBATE, The Italian Futurists, Mella Jaarsma, Alison Knowles, Suzanne Lacy, Lee Mingwei, Laura Letinsky, Tom Marioni, Gordon Matta-Clark, Mildred's Lane, Julio César Morales and Max La Rivière-Hedrick, motiroti, National Bitter Melon Council, Ana Prvacki, Sudsiri Pui-Ock, Michael Rakowitz, Ayman Ramadan, Red76, David Robbins, Allen Ruppersberg, Bonnie Sherk, Barbara T. Smith, Daniel Spoerri, and Rirkrit Tiravanija. In 1945, Georgia O'Keeffe purchased a four acre site with an adobe hacienda style house built around a central patio, on a mesa in the village of Abiquiu. Constructed from local materials, the uninhabited house was a ruin returning to the earth, when she first saw it. O'Keeffe welcomed the opportunity to rebuild it and make it her own, suited to her artistic practice. O'Keeffe lived and worked in the house for the rest of her life, finding continuing inspiration in the architecture of the home and the views of the surrounding landscape. This exhibition brings together paintings inspired by her Abiquiu home, some seen for the first time in many decades. It also includes a reconstruction of the view from her studio, centered on a work table of her own design, arranged with her original art materials and tools. O'Keeffe engaged Maria Chabot, to assist her with the restoration of the walled compound in Abiquiu. While the footprint of the structure was faithful to the original, Chabot reimagined new uses for the existing rooms. She mapped a plan for domestic spaces, a garden with fruit trees, the largest studio the artist ever had, and a plan to enlarge the windows toward the view of cottonwood trees to the north and the mesa east of the house. Surrounded by a wall, the house looked inward to a patio, and did not offer the dramatic vistas of O'Keeffe's first home at the Ghost Ranch. The only possibility for gaining a view of the surrounding landscape was beyond the walls of the compound. Chabot imagined a studio in a separate building at the edge of the mesa that had previously functioned as a stable and buggy house. It sheltered the largest interior space on the property and offered the only possibility for an extended view. Further, Chabot suggested opening the wall in O'Keeffe's studio with a picture window, which allowed an endless view toward the Chama River Valley and the Jemez Mountains beyond. During the 1950s the overlook from her studio inspired O'Keeffe to create more than two dozen paintings of the cottonwood trees that grew along the river below. Ten of those paintings are included in this exhibition. Though the studio window was an extravagant luxury in rural New Mexico, Chabot asked O'Keeffe if she would also like her corner bedroom to be “mostly glass.” With O'Keeffe's consent, Chabot installed a modern picture window in the studio along with an expanse of glass at the corner of the adjoining bedroom. The view from the artist's bed room window also stirred her imagination. In 1952, O'Keeffe began to visualize the winding road that cut through the landscape in a series of ever-more simplified compositions. Paintings and drawings of the mesa and road are also part of the exhibition. The paintings that comprise this exhibition are emblematic of O'Keeffe's endless fascination with the color and form of her surroundings in northern New Mexico; a landscape that inspired her art and the reconstruction of her home and studio in Abiquiu. During the course of 2014, the gallery installations will change to reveal different views of the property, including images of her famous patio and the black door. A celebration of sight, sound, and activity for visitors of all ages, Heartbeat: Music of the Native Southwest, opens Sunday, September 29, 2013 at the Museum of Indian Arts and Culture. Over 100 objects relating to Southwestern Native dance and music will be featured, including a flute made by Grammy award-winning artist Robert Mirabal of Taos Pueblo. Collectively used for indigenous ritual performance, the drums, flutes, rasps, rattles, and clothing featured in the exhibition convey a richly layered message. Music, too, is integral to the ceremony—it is more than accompaniment for the dancers; each song is a prayer providing a pathway to the here and now and to the worlds beyond. Native music of the Southwest is still shaped by traditional cultural practices, as well as today by those powerful disseminators of American and World music, the internet, television, radio, CDs, and DVDs. In the gallery, the sights and sounds of Native dance and music can be experienced in multiple interactive zones. Visitors can listen to the wide array of Native music being produced today, how different types of instruments sound, and view historical footage of dance performances. And make your own music in the Heartbeat Recording Studio. Music is fundamentally interwoven into the everyday lives of Native Americans; continuing to bind the ancient cultures of the Southwest to their lands and life ways. Heartbeat: Music of the Native Southwest, through a Native curatorial voice, explores this enduring connection between the past and present. Photography exhibit explores how land and sky changed an artist's vision Beginning with his early years working as a research photographer at the Sacramento Peak Solar Observatory in southern New Mexico, photographer Donald Woodman honed his photographic vision first through stars and clouds and then through sandy soil, majestic peaks and his own interior life. Donald Woodman: Transformed by New Mexico explores that journey through a series of photographs on exhibit February 23 through October 12, 2014, in the New Mexico History Museum's Mezzanine Gallery. Transformed by New Mexico is one of the commemorations of the museum's fifth anniversary, a yearlong series of exhibits and events celebrating all the museum has accomplished since its opening in May 2009. In 2011, Woodman was the first person to donate his photographs, negatives, books, diaries, equipment, and research material to the Photo Legacy Project at the Palace of the Governors Photo Archives. The Photo Legacy Project aims to collect the work of contemporary photographers to bolster the archives historical holdings of nearly 1 million images. Donald Woodman: Transformed by New Mexico includes more than a dozen examplesof the Belen-based photographer's work from the early 1970s to 1998—a period in the artist's life when he abruptly abandoned the formative but conservative East Coast and committed himself to a new life and vision in New Mexico. The exhibit traces his early photographs, made while studying with his most important mentor, Minor White, at the Massachusetts Institute of Technology. The images continue through scientific explorations at the Sacramento Peak Solar Observatory in Sunspot, NM, examinations of light and landscapes, and intimate selections from The Therapist Series. Each of the images invites the viewer to look deeply at the tones, forms and shapes; to begin to understand the relationship Woodman has with his cameras, his world, and himself as he moves quietly from behind the lens to placing himself in its focus. Dine Terra's communal table for a Chef's choice family-style meal every Tuesday night until March 25, 2014 for only $35 per person. Reservations required. For reservations or information please call 505-946-5800. Join us every Wednesday in the Living Room from 5:30pm - close to explore vino varietals from around the world! Discover a new region or varietal each month. Enjoy $12 tasting flights featuring four different wines and nosh on a paired appetizer inspired by the featured flight. Plus, our professional sommelier will be on-site providing mini tableside wine 101 demos. Friday, March 7, 7:30 p.m. Great Hall, Peterson Student Center $40 at the door Jointly sponsored by St. John's College and the Santa Fe Concert Association. Limited free admission for students, tutors, and college staff. Join twelve New Mexico high school students as they compete to become the Poetry Out Loud state champion. Hear classic and contemporary poetry recited by New Mexico's own. Musician Bill Williams and Poet Cyril Christo will present reflections on the cryosphere. Bach's Easter Oratorio with the NM Bach Society March 9, 2014 at 4 PM Stieren Orchestra Hall at The Santa Fe Opera A performance of Johann Sebastian Bach's Easter Oratorio with the New Mexico Bach Chorale and Orchestra. The New Mexico Bach Society's all-professional choir and orchestra are led by Music Director and Conductor Franz Vote, who conducted at the Metropolitan Opera for 12 seasons. Latin World Music 7:00 pm No Cover Along with Nacha Mendez, feel free to join El Farol with several of their other artists within the Cafe Society such as Trey Keepin & ¡Santastico! Enjoy sophisticated, world-class entertainment while savoring delectable Spanish tapas, wines, and liqueurs exclusive to El Farol. "Wine” down your weekend with specially priced wine by the bottle at Terra Restaurant or Bar on Sundays until March 30, 2014. For more information please contact Terra at 505-946-5800. 10:30 am -12:30 pm & 1:30 pm - 3:30 pm Monday through Friday The Allan Houser Sculpture Garden offers you the opportunity to experience the work of an American Master. The garden features 85 of Houser's most famous bronze, steel, and original stone sculptures, set amongst the lush juniper pines and beautiful New Mexico skies. The on-site gallery features an additional 100+ sculptures, drawings and paintings – all works by Allan Houser. It is truly a memorable experience. Tours are by appointment only. $25 per person + Tax. (505) 471-1528. Please visit us at our website at www.allanhouser.com. Since its inception in 1966, Glenn Green Galleries (formerly known as The Gallery Wall, Inc,) has presented a wide variety of international artists in their galleries in Phoenix, Scottsdale and Tesuque-Santa Fe and has sponsored exhibits in Europe, Japan, South America and Mexico. Their artists have shown their work in such places as The Pompidou and Grand Palais, Paris, London's British Museum and the Museum of Modern Art in Mexico City. Glenn and Sandy Green, owner-directors, acted as representatives for Allan Houser from 1974 until his death in 1994. As art consultants, the gallery advises museums, corporations and individuals alike on building their art collections. We are accustomed to arranging sculpture commissions and placing sculpture for clients. An art treasure located in the lovely historical village of Tesuque - just six minutes from Santa Fe's Plaza. The Greens hope the that art collectors will enjoy the works they show online and that they will personally visit their varied & expansive gallery and sculpture garden in Tesuque-Santa Fe, New Mexico and the world-famous 250- acre Phoenician resort in Scottsdale, Arizona where they display art throughout the interior and grounds. To reach our Tesuque Sculpture Garden, 5 miles north of Santa Fe, just six minutes from Santa Fe's Plaza take Hwy 285 to Exit 168/County Road 73 and travel 1 mile to #136 Tesuque Village Road, first entrance south of the Tesuque Village Market. WHEN: March 10 & 11, 2014 Exhilarating and provocative this is a must-see for mountain enthusiasts and those with a spirit of adventure. Through the big screen you will experience the highlights of adventure sports such as climbing, kayaking, alpine skiing and mountain expeditions and also visit remote cultures and some of the world's last great wild places. An example of both love and tenacity, Dorothy and Herbert Vogel's passion for art and artists led to the formation of a significant collection of contemporary art. Over the course of their forty year marriage the two art aficionados and civil servants (a postal clerk and a librarian) amassed close to 5000 works of contemporary art in their collection. The New Mexico Museum of Art was selected to receive a gift from the notorious collectors “Herb and Dorothy” Vogel, and is pleased to be sharing these new additions to our collection with the public. Noted for their interest in new, and, often difficult artwork, the collection includes many minimal and conceptual artists. Artworks and artists included in the donation to the New Mexico Museum of art include Robert Barry, Linda Benglis, Jene Highstein, Edda Renouf, Judy Rifka and Richard Tuttle. The objects are as varied as Richard Tuttle's subtle watercolor marks on loose leaf paper to Ron M. Fisher's funky assemblage, Apparatus Lamp. Through the National Gallery of Art, the Vogel collection has been distributed throughout the United States. An allotment of fifty artworks has been gifted to one institution in each of the fifty states. The New Mexico Museum of Art is honored to be the recipient of this generous gift and celebrate these additions to our collection. For more information about the Dorothy and Herbert Vogel Collection, you can go to the website http://vogel5050.org/ or read the book, The Dorothy and Herbert Vogel collection : fifty works for fifty states which is currently available in the museum's library. Greensky Bluegrass: Bluegrass/Newgrass/Jam Band - Kalamazoo, MI Progressive Bluegrass at its best comes to Sol Santa Fe March 12 at 7:30. Tickets are $15 in advance, $20 at the door. On sale at Tiketssantafe.org and the Lensic Box office. 505-988-1234 As their name might suggest, Greensky Bluegrass utilizes traditional bluegrass instruments – dobro, banjo, guitar, upright bass and mandolin. However, the music that they make is anything but reversionary and the new album, Handguns is a brave expression of what separates their original music from the rest of the bluegrass genre. Handguns was recorded in between tours this winter as the band holed up in a studio in their home state of Michigan, committing the songs straight-to-tape on the exact recording console that originally birthed Lynyrd Skynyrd's infamous track "Free Bird” decades earlier. Matching the warmth of the analog sound, vintage microphones were utilized alongside state-of-the-art studio equipment to create a truly blended and artful sonic experience. Greensky has continued to gain national momentum since they won the Telluride Bluegrass Festival's coveted Band Competition in 2006 and have been invited to play at last summer's Northwest String Summit, Grey Fox Bluegrass Festival and NPR's Mountain Stage, while also playing at Bonnaroo, Bumbershoot and Hardly Strictly Bluegrass. As these diverse festivals would suggest, they're a bluegrass band but they're not. Bluegrass doesn't have distortion, or horns for that matter. Greensky does. Manitou Galleries at 225 Canyon Road presents, "Western Images", a show of classic western imagery by gallery artists: Gregg Albracht, Gary Lynn Roberts, Marlin Rotach, Billy Schenck, Gail Gash Taylor, and Don Weller. Gregg Albracht's photography bespeaks of his unending passion to capture what Henri Cartier-Bresson, called the "decisive moment." Albracht says, ”to experience a magical moment when everything is just perfect is a rare thing, but when it happens, to be there to capture it, experience it...to hold that moment forever in a photograph is what drives my life." The son of noted Western artist Joe Rader Roberts, Gary Lynn Roberts grew up surrounded by art. "I was fortunate to grow up in that atmosphere" he says. "In addition to my father, I received one on one training from many of his friends such as G. Harvey and A.D. Greer to mention only a couple. Many of my trainers were some of the Nation's most notable artists". The desire to capture history on canvas by totally researching the event depicted has made Gary Lynn one of America's most sought after historical print artists. Gary Lynn says "I want to do more than create a historically correct scene; I want to tell a story. When someone views one of my paintings, I want them to feel like they are part of the painting." Marlin Rotach has known since a very early age that painting was his lifelong ambition. Born and raised in Salina, Kansas. He earned a B.F.A. in painting from Kansas State University. While attending K-State, he met and married his wife Carol. Rotach went on to complete his M.F.A. at the University of Nebraska. He then taught design, drawing, and painting at the University of Missouri-Kansas City. Since the mid-1990's Marlin Rotach has worked almost exclusively in watercolors, doing paintings for both galleries and private commissions. Wine and Cider Barrel Tasting! Join us for a barrel tasting of our barreled wines and New Mexico Hard Ciders and 5 finished wines. Attendees must RSVP. $15 per person. Attendees must be here when event starts at 3:00pm. The free Music on the Hill™ concert series, sponsored by St. John's College, just concluded its eighth season. We thank all our sponsors that make it possible to mount this popular Santa Fe summer event. Next summer's concert dates are June 11, 18, and 25, and July 9, 16, and 23. The line-up of performers will be posted soon. Advance tickets highly suggested. $25 per concert. Tickets go on sale January 6, 2014. ALH Foundation-John Greenspan and Julianne Bodnar; DMC/ D Maahs Construction; New Mexico Bank and Trust--Santa Fe; Verve Gallery of Photography; and an anonymous donor. WHEN: March 18, 2014 There is no other band around today that plays with the rhythm, feeling, or explosive power of the Dap-Kings, there is no other singer that can match the energy and honest soul of Sharon Jones, and there is no other record that embodies this captivating sound better than their latest studio endeavor, Give the People What They Want. Cheri Ibes is a Santa Fe-based installation artist whose experimental works subtly examine our relationship with the environment. Her temporary outdoor installation, Catchment, will be on view March 19-25 in front of the Munoz Waxman Gallery. Polyphony: Voices of New Mexico presents Bach's Birthday! Celebrate Bach's birthday in the nave of the cathedral with organist Maxine Thévenot and Polyphony: Voices of New Mexico as they present a unique program of the Lent and Easter chorales from the Orgelbüchlein. The chorales will be sung by the choir, then Bach's reharmonizations of the chorale tunes will be played on the magnificentReuter pipe organ. WHEN: March 21 & 22, 2014 Come see the world premiere commission by choreographer Nicolo Fonte. Known for his daring and original approach to dance, this will be Mr. Fonte’s eighth commissioned work. Joining the lineup is choreographer Cayetano Soto’s wildly popular, Beautiful Mistake and Norbert de la Cruz's striking Fold by Fold. Sunday Social Sipper and Vinyl/Cd Swap! Sunday Social Sipper & Vinyl/CD Swap – Music and Wine! Looking for something to do on a Sunday? Want to swap out some vinyl records and disks? Here's your chance to spend a fun afternoon meeting new people, talking about music, and refreshing your music collection with new tunes you'll swap for your old ones while drinking our delicious wines! Cost: $6.50 includes a wine tasting of 6 wines. Must RSVP (online or by phone) and please be here promptly at 2:00pm when the fun begins! (Maximum of 15 total items). For more information, please call our friendly staff at 505.455.2826. Salud! BRUCH & RACHMANINOV CASE SCAGLIONE, CONDUCTOR Borodin, Polovtsian Dances featuring The Santa Fe Symphony Chorus Bruch, Violin Concerto featuring CLARA-JUMI KANG, INDIANAPOLIS VIOLIN COMPETITION GOLD MEDALIST Rachmaninov, Symphony No. 2 Underwritten by Michael Melody & Bonnie Binkert Free preview talk at 3 pm The Santa Fe Symphony Orchestra & Chorus is Santa Fe's professional full-sized orchestra with volunteer chorus. We focus on orchestral masterpieces that thrill your senses and feed your soul. Please join us during our exciting 30th Anniversary Season of performances at the beautiful Lensic Performing Arts Center, featuring outstanding gold medalists, first prize winning soloists, and beloved masterworks. The New Mexico Museum of Art and El Rancho de las Golondrinas co-present a winter lecture series. The final in the series will be held in St. Francis Auditorium, inside the New Mexico Museum of Art on the plaza in Santa Fe. Admission is free. "The Canes of Sovereignty: Enduring Symbols of Pueblo Independence" by Robert Torrez, former NewMexican State Historian. These acknowledgements of Pueblo self-government by Spain, Mexico and the United States are still revered today. The Colorado River is the most dammed and diverted river in the world. As it struggles to support 30 million people and the Colorado River Pact, WATERSHED asks many important questions about the future of the river and watersheds in the American West. Can we meet the needs of a growing population in the face of rising temperatures and lower rainfall in an already arid land? Can we find harmony amongst the competing interests of cities, agriculture, industry, recreation, wildlife, and indigenous communities with rights to the water? Chef David Sundberg (of Blue Corn Brewery) discusses the art of selecting and tasting fine international and American craft beers while you sample prime examples of many different styles. Light fare provided throughout. Mystical Journey to New Mexico with Dana Micucci Award-winning author and healing practitioner Dana Micucci will be leading an exciting three-day transformational retreat at the historic Ojo Caliente Mineral Springs Resort and Spa as part of a one-of-a-kind journey to Mystical New Mexico in cooperation with SusanDuval Seminars. With ritual, mediation and esoteric practices, we will delve deeply into the ancient mysteries of the world's wisdom traditions, learning how to activate your light body for higher dimensional living.We will also soak in the sacred healing waters of Ojo, hike to the stunning Mica mine and take a field trip to the breathtaking Christ in the Desert Monastery in nearby Abiquiu. If you’d like to extend your stay before and after the retreat, we have designed a suggested itinerary for visiting the historic and sacred sites of northern New Mexico and indulging in the considerable magic of this unique part of the world—from Georgia O’Keeffe country, the majestic Taos Pueblo, and the “holy dirt” church at Chimayo to lovely inns and restaurants, and Native American handicrafts and jewelry. For details on this potentially life-changing adventure, visithttps://susanduvalseminars.com/New_Mexico.html. Sign up by early October for discounts on the retreat and hotels. Dana Micucci has enjoyed a decades-long career as a widely published journalist and author writing about culture, travel and spirituality. Her recent book, Sojourns of the Soul, was a gold winner in the 2013 Nautilus Book Awards. She is also trained in a variety of healing modalities and conducts transformational talks and workshops nationwide. For more information, visit www.danamicucci.com. $50. The people behind San Francisco's favorite restaurant, Dosa, are new to Santa Fe and have teamed up with CCA and SCUBA to produce a delicious event. Creative South Indian delights are served on SCUBA's hand-made ceramicware. Take your unique plate home at the end of the night! WHEN: Through May 27, 2014 Doña Sebastiana, New Mexico's traditional death figure, has gone through many transformations over the years. In this exhibit we explore her historic use and significance as well as more contemporary interpretations of this foreboding figure. Copyright © *2014|* *|CITY DIFFERENT REALTY*, All rights reserved. Santa Fe makes the lists...again! Santa Fe, the No. 2 favorite outperformed most other cities when it came to cultured, mellow pursuits, such as checking out art galleries (rated No. 4), appreciating architecture, and browsing the top-rated independent shops. August 2012 Hotwire.com lists Santa Fe #7 (the top US city) as a "top 10 international destination" for art and architecture. The list, in order, includes Paris, Florence, Vatican City, Berlin, Amsterdam, St. Petersburg, Santa Fe, Los Angeles, Sydney, and Tokyo. July 2012 Santa Fe is the small city with the best food in the country, according to the Rand McNally/USA Today"Best of the Road Rally." According to the American Lung Association's "The State of the Air 2012" report released April 25, 2012, the Santa Fe-Española Metropolitan Statistical Area was the only city in the country to be ranked cleanest in all three categories of pollution measured in the report: short term particle pollution, long-term particle pollution, and ozone pollution. April 2012 Travel + Leisure magazine has ranked Santa Fe among America's Favorite Cities, one of the greenest cities in the U.S., and gave it first place for "cultural getaway." Santa Fe also ranked high for independent boutiques and for fine dining. December 2011 Santa Fe ranked #11 in the "15 Best Housing Markets for the Next 5 Years," Business Insider. It's rodeo time again in Santa Fe! The Rodeo de Santa Fe begins today and runs though Saturday. As a PRCA sanctioned event it draws almost 600 PRCA contestants. This is not your Ma and Pa rodeo, either. You can expect to see several well-known cowboys and cowgirls, including World Champions Taos Muncy, Trevor Brazile and JW Harris. This year's rodeo queen is Alexandria (Alex) Layne Tapia. Alex is the 22 year old daughter of Toni Tapia and the late Michael J. Tapia Sr. She was born and raised in Santa Fe, New Mexico. She is currently a Crimson Scholar at New Mexico State University majoring in both Government and History. Rodeo de Santa Fe is fun for the entire family--a carnival midway, food concessions, mutton bustin' and more can all be found. Individual tickets start at $10.00 and up to $27.00 (prices include parking). Rodeo grounds are located at 3237 Rodeo Road, Santa Fe, NM. For more information call (505) 471-4300.